I decided to write today because I have a lot coming up and a lot on my mind. This is my safe place, so here I am. No one can tell me how to feel here, and no one can interrupt me. No one can silence me by throwing scriptures at me. It’s a great feeling to have this safe place! All adoptees need a safe place! My “Birth” day is in 6 days. My Sobriety “Birth” day is in 5 days. My Testimony at Celebrate Recovery is in 13 days. My mind is racing and the devil is doing a number on me because he doesn’t want to see me make it to my 3 year sobriety. He doesn’t want me to make it to give my testimony, and he loves to see me in total sadness about my “birth” day. It’s just ridiculous but I do have hope that if God can heal my broken heart he can heal the way I feel about my birthday! I’m just not there yet! 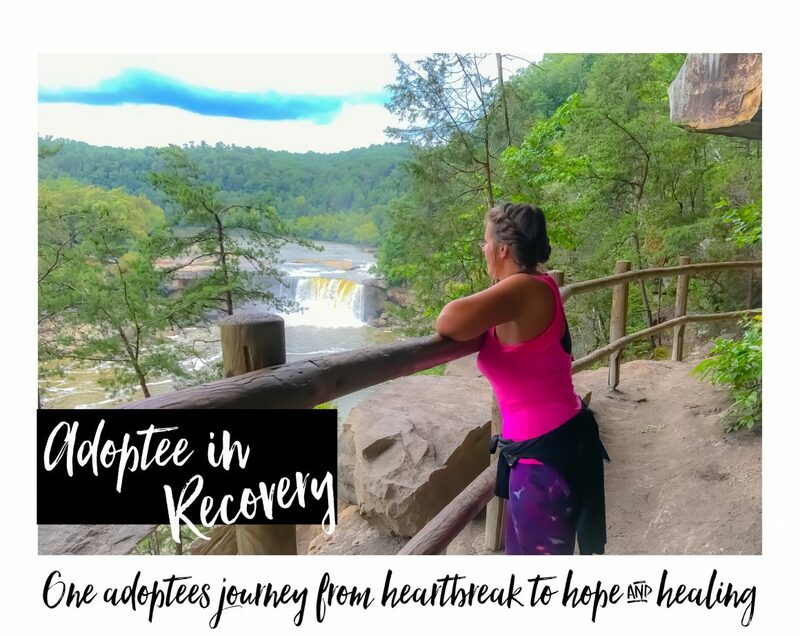 I still have to write about how God healed my broken heart from my adoption experience, and what the tools were that worked from me. I am going to write about it soon! I promise. It’s good stuff! What I am realizing that there is more to it, than just my broken heart. I have always struggled with my birthday. I know my fellow adoptees get it. Putting on a smile for the world, when the deep pain and sadness has to be hidden to make other’s feel comfortable. I’ve decided I’m going to try to do something nice for myself each day until it passes. Like go buy a slurpie from the gas station, and take a ride with the sunroof open. Or go for a walk by myself. Go to a few yard sales, or shop at Goodwill. (yes I said it. I am frugal, I’m not ashamed!) Maybe even go to a few coffee shops, or for a walk in a park. Whatever makes me feel better about the day I lost everything. If you are an adoptee and you struggle with your birthday please leave me a comment, so non adoptees don’t think I’m crazy or just being negative please? Honestly, why do I even care about what others think? I thought I was going to stop doing that! I guess I’ve been so conditioned to “feel” a certain way about being adopted, that when I share my TRUTH it still seems surreal to be able to do it, not just with my fellow adoptees but with everyone. I’m working hard at not caring what others think, and just share my truth. My truth is as soon as August approaches I start to get really sad, down and disconnected with everything around me. My birthday is a very painful day for me, so are the weeks that approach it. If I could just “get over it” I would. Don’t you think I would rather be happy on that day? Do you think if I could just make that choice, I would? I feel like there is some unfinished business of healing in that area that I need to do, because usually that’s why we stay in pain. Unfinished deep healing of wounds from our past. I know God heals and I know he will heal me also! I look forward to the day where I can write as I CELEBRATE the DAY I WAS BORN! What I think of during the days that lead to my birthday is what my birth mother went through at that time. How she felt. What happened the day I was born? Was she sad that day? Was she happy to get it over with and move on with her life? Did she ever hold me? Did she name me? What was the atmosphere in the room like that day? Was she at peace with her decision? As my mind races with these thoughts, it consumes my mind August 1st-Aug 13th. By August 14th I’m better, and I don’t think much about that day for 11 more months. It’s definitely a cycle, because it’s done this every year my entire life. I used to drink, and of course that numbed the reality of the pain I was facing. Soon I will reach 3 years sobriety, and the pain has never been more real. I like to think of adoptees as “Special Needs”. I can speak for myself on that, because I am definitely a special needs person. Working through my 2nd step study in Celebrate Recovery I’ve discovered more deep rooted issues regarding my adoption experience. The fact that anything in the “UNKNOWN” realm is something I don’t take well AT ALL!!! UNKNOWN is uncertainty, and I have lived almost all of my years on this earth not knowing what is going on about MY LIFE!!!! PEOPLE chose for me, and NOW that I’m able to choose for myself I NEED TO KNOW WHAT IS GOING ON. AT ALL TIMES. I have to plan everything to a tee, and if I don’t I get fearful and it’s not a good place for me to be. This is all rooted in fear, and I know where it comes from. I know hundreds of adoptees who have the same issues. So when I plan it leads to confirmation, of what’s next. I know what to expect, I know what’s going to happen. I know where I’m going and when I need to be there. I’m on schedule, I’m on task, I’m not late, and I know where I need to be at all times. What does the UNKNOWN feel like? What does UNCERTANTY feel like? Well it takes me back to my childhood when I felt like I was an alien on this planet, not knowing where to turn or where to go. It takes me to searching for my biological family everywhere I went but never knowing who they were or where they were. It takes me to the lies people told me to benefit themselves. There are lots of lies and secrets in this adoption thing, and that is certain. The UNKNOWN takes me to a state of fear I don’t want to be in. I took a trip this past week. I realized it was going to be harder than expected because I had to release ALL CONTROL to God and everything about the trip was uncertain, and unknown. I took it as a challenge, for me to be able to take this trip, and I tried to look at it as a way for me to get closer to God, and for me to release my control to him and just know that he was going to take care of everything. It was very difficult for me to do this. I know this isn’t only a struggle for adoptees, but for people in general. But I speak from an adoptees standpoint. It was extremely difficult but I made it! Adapting to my surroundings and nothing was familiar surrounded me with everything being uncertain, or unknown. IT WAS HARD! I’m a very simple person. I don’t need fancy things to make me happy. I’m not into material things. I love simplicity. I love nature, being outside, the sun rises and the sunsets & the sky. I could be as happy in an efficiency apartment as I would be in a huge 5 bedroom house filled with material things. Things don’t float my boat. I’m more of a time person, because in this adoption thing so much time has been lost, never to return. Time spent and memories made and pictures to prove it are things I hold close to my heart. As I venture through the next 2 weeks of my life, and overcome the challenges that come my way (as they always do in August) I’m very sensitive with people leaving me at this particular time. I say “Leaving Me”, yet they might just be going away for a few days. With my birth mother “Leaving Me” at this time 41 years ago, I find people leaving a trigger, so I tend to retreat to myself and stay away from everyone I can. I’m safer that way. It would be nice if someone understood this, but so far the only people that get it are my fellow adoptees, and God. I know he gets it. I know this is another part of my “Special Needs”. I can’t expect anyone to really understand, unless they have been through it. As for celebrating my sobriety “birth “day which falls the day before my legal birthday it’s pretty difficult for me. The birthday pain overpowers the joy of the sobriety birthday and I’m holding onto hope that this will change. I WISH I COULD ERASE THE DAY I WAS BORN. To me, this seems like it would solve everything.. But I can’t. I know in my heart of hearts, God planned me to be here so I’m here. I’m stuck. I can’t go back unless he says it’s my time. I can’t wait for that time by the way, no more adoptee pain. For now, I will share my feelings here, and let all the other adoptees know that healing is possible. Recovery is possible. Using alcohol to numb my pain for 25+ years only delayed my healing. In order to truly heal, I had to fight kicking and screaming to gain my TRUTH (it’s hard when the world is lying to you!) and once that happened, I decided alcohol wasn’t going to help me heal so I had to make the choice to let it go. But you see finding my TRUTH I found out both my birth parents were alcoholics, and this was a major eye opener for me to want to make the change for myself and for my kids. It was the best decision I ever made, BUT dealing with the aftermath of lies, secrets, and trauma that is ignored in adoption it’s taken me years to get to a point where I can share my feelings, and not be scared of what people will think. If my blog can help one adoptee, it’s worth it. Writing is healing to me. Sharing my feelings is healing to me. Knowing other adoptees understand and I’m not alone is healing to me. If you have made it this far, thanks for being a part of my “Adoptee In Recovery” journey! Next: I’m going to write a letter to my birth mother. I want to let her know a few things, and to share what’s on my heart a week before my birthday. I will share it in my next blog post. Ta Ta for now. The day of our birth is so very dark, as adoptees. It’s loss and separation. I’ve never felt worthy of celebration on that day- mostly, I wonder if she remembers.. This three year “birth” day of sobriety is a re birth, no? Is it worthy of the celebration? Oh my, yes. One day, one step, one second at a time and you’ve made it to THIS place. So proud of you and your journey. I am leaving a comment to let you and others know that you are not “crazy” or “negative” (gosh, I hate that word). I am older than you are, and my birthday is still the darkest, most grief-filled day of my life. You are courageous for writing this. Non adopted people simply cannot understand. Hugs to you. Oh, I really don’t enjoy birthdays at all. It used to be a bunch of fuss, and I’d have to act happy when all I wanted to do was crawl in a hole and be alone. Thanks for sharing. It helps me recognize feelings I have that I don’t understand or didn’t realize were there. I love reading your blog and knowing that there are people who understand what I’m going through even though I really don’t understand it all yet. Thank you! Thank you so much for sharing your journey. “If my blog can help one adopted person it’s worth it”. No doubt your writing is helping many adoptees. It’s certainly valuable to me. So glad you are progressing through healing. No. You are not crazy at all! Birthdays often are such a drain. I have so much to be thankful for, but not acknowledging the losses is what kept me in the fog– even after 23 years of a pretty good reunion. At least in seeking/ finding the truth we take back our power over the triggers like birthdays and don’t have to live in the altered reality of adoption anymore – the truth sets us free. Thank you so much for reading my blog and it’s helped you. That is exactly why I write and share my journey. Just so other adoptees know they aren’t alone. That alone feeling is something I lived with ALL MY LIFE. I promise myself as long as I live I will reach out to other adoptees so they know they aren’t alone.